The last time I made these was a few months ago, and I didn't take great photos for this recipe, so I wasn't going to put it on the blog. But yesterday I was talking to a friend who declared these the "best thing I've ever eaten!" (I was impressed that she even remembered them from months ago! ), and I figured the recipe needed to be shared with the world, bad photos or not. Directions: 1. In a large bowl, whisk together the oil, eggs, buttermilk, sour cream, and 2 tsp vanilla. 2. 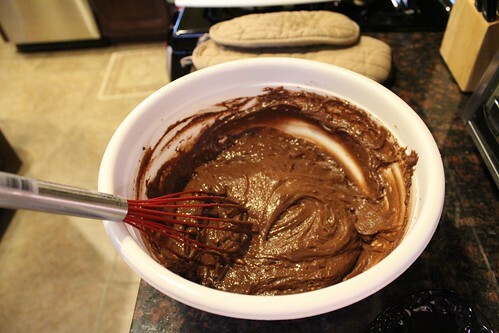 Add the cake mix to the wet ingredients and mix until well-combined. Spoon batter into cupcake liners. 3. Bake at 350 for 16-19 minutes (regular cupcakes) or 8-10 minutes (mini cupcakes), or until a toothpick inserted in the center of a cupcake comes out clean. 4. While cupcakes are baking, beat cream cheese and butter until smooth. Add 1 tsp vanilla and coconut extract and mix. Add powdered sugar 1 cup at a time and mix until smooth. 5. Put shredded coconut in a small bowl. 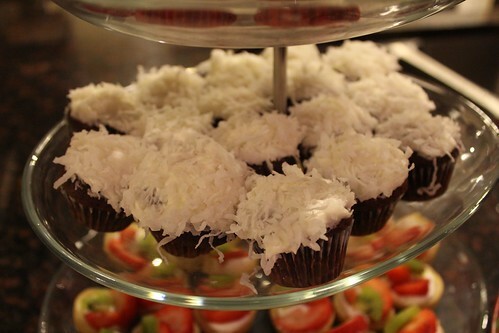 Frost cooled cupcakes with the coconut cream, then dip the tops in the shredded coconut.